Camden Catholic raises money for worker's son battling cancer. Sharrie Williams reports during Action News at 4 p.m. on December 20, 2018. 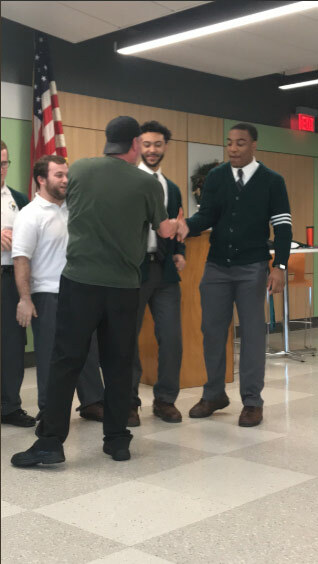 CHERRY HILL, N.J. (WPVI) -- A dining hall employee got an early Christmas surprise he will never forget from the students and faculty at Camden Catholic High School. Joe, as he is known by those walking the halls of CCHS, did not know what was awaiting him when he went into work on Wednesday. Unbeknownst to Joe, his school community had raised funds for him and his family. After learning Joe's son was battling brain cancer, the faculty and students wanted to help in some way. "We found out this year that Joe's son had brain cancer and we all felt we needed to help out with the financial burden during the holiday season," Bridget Sipera, McAuley Program Chairperson and Head Girls Lacrosse Chairs at Camden Catholic, told 6abc.com Thursday. "The kids really stepped up. The dress down was for $1 and the students amazed us with how much money they donated," Sipera said. The goal was to raise $1,000 for Joe and his family - but the students and staff had other ideas. Sipera said instead of just bringing in $1 each, the kids and adults brought in $5, $10, $20, and even $50 to surpass the $1,000 mark. Joe found out that the school was raising money for his son as the morning went on, but he had no idea just how much. Then Joe was brought into the John Pisa Dining Hall where students surprised him with a check for $2,500. 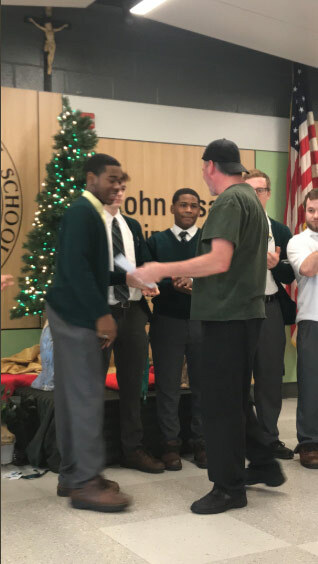 The valued member of Camden Catholic High School was overwhelmed with emotion. "He thanked everyone in each lunch, and then this morning, he was smiling ear to ear and fighting back tears. It was a really special moment," Spiera said. The money raised showed just what Joe means to those who teach and learn at the school every day. Spiera said he is just an "amazing guy." "You would have no idea when you talk to him that he's going through something like this. He always has a smile on his face and always asking 'how are you' or saying 'have a great day,'" Spiera said. She said Joe can always be found talking to the kids - wanting to know how their day is going or what's new in their lives. "Just a very special guy," Spiera said.